Welcome to the Wolebury Golf Club Junior section. We cater for boys and girls of all levels of ability, from absolute beginners, improving golfers to advanced junior players who have official handicaps and are able to play in club competitions. We have a dedicated group of organisers (mostly parents) who ensure the smooth running of the junior section, organising competitions and coaching sessions for all junior members in a safe environment. There is a full and varied programme of golf for all ages and abilities, from our academy sessions for the very young ones, intermediate improving golfers going out onto the course for the first time, through to team players representing the club in team events and competitions. Worlebury Golf Club has a long history of developing junior golfers, with boys and girls going on to represent Somerset Golf Union at all junior age groups, with many of the ex-juniors going on to become club champions. The Junior Academy is a first introduction for the very young minimum age of 6 and/or inexperienced juniors. For the new starters, we run the ‘Junior Golf Passport’ programme as part of our Academy coaching sessions led by the new club professionals Scott Thompson and Roy Baker. This follows the nationally structured learning programme for children new to the game. It is a fun way to learn, with games and challenges that enable a child to progress from a complete novice golfer into a junior golfer, ready for junior membership at the club. Juniors must be under the age of eighteen on the 31st December in order to qualify as a ‘Junior’ Member. Applicants for membership should obtain a Junior Membership Form from the club office. When the form is returned, the Junior Organiser will assess the applicant’s playing standard and will either confirm membership or recommend they join the Academy Programme. Our junior subscription rates offer great value for money with no joining fee. When a junior has obtained membership of the junior section, they can take part in organised junior roll up sessions on the course (supervised by Junior organisers). At these sessions juniors can play either 3, 7, 9, or 15 holes depending on their age and experience. These are a great opportunity for juniors to get to know other junior members and make friends. Whilst at the club with your son or daughter, you can take some time out to relax and have a drink on the club patio and enjoy the breathtaking panoramic northerly views across the Bristol Channel to the Welsh hills in the distance. Through out the year there are a large number of junior competitions held on a weekly basis during the school holidays for all juniors with handicaps. There are trophies to play for including: Commsplus, Junior Masters, H&H Alarms, Eric Snow, Centenary Trophy and the Junior Club Championship. There will also be team matches against the club’s Avalon teams and the Senior members, which will enable our juniors to benefit from playing with some of our more experienced golfers in a relaxed but competitive atmosphere. We also enter junior teams in Inter-Club knockout competitions and League Matches organised by the Somerset Golf Union. Worlebury Golf Club’s, commitment to Junior Golf is underpinned by our GolfMark accreditation that was attained from England Golf (EG) in 2012 with a “High Achiever” status. In October 2016, we attained the new, and improved, GolfMark Award issued by EG along with Sport England’s Clubmark Award. These National awards recognise that the club has a high level of coaching and playing facilities and that all the correct polices and procedures are in place to provide excellent golf opportunities for juniors within a well organised and safe environment. 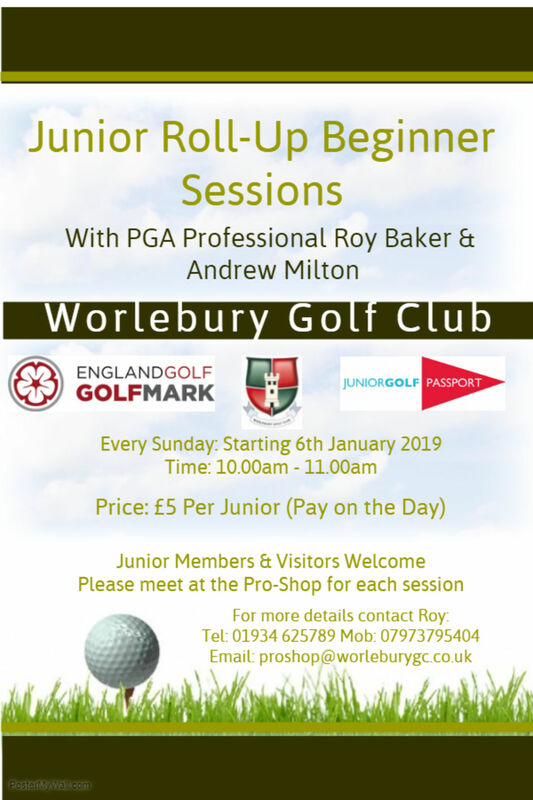 Worlebury Golf Club Junior Section offers boys and girls under the age of 18 the opportunity to develop their game in a friendly, supportive and safe environment. If you are interested in your child joining the junior section, or would like them to take part in the Academy group coaching sessions, we would be delighted to talk to you. For more details please contact our Junior Organiser Ken Hanson on 07725 198644 or Club Professionals, Scott Thompson or Roy Baker on 01934 623932 or visit them in the club shop to find out more. This section contains the documentation relevant to the 'Codes of Conduct' for Juniors playing Golf at WGC and Professional Coaches, Staff and Volunteers involved with Junior Golf at WGC. This sections contains the documentation for the 'Safeguarding and Child Protection' of WGC Juniors.